STYLE ~ cardigan. SIZE ~ large. COLOR ~ red/black. Black cowl neck. Ribbed Cowl Neck: 7" unfolded. 83% cotton and 17% acrylic. Machine wash cold and lay flat to dry. RN 41381, Supplier #00000771, PO 1196618. Made in China. This previously owned and washed sweater top looks like it was rarely worn, if ever. 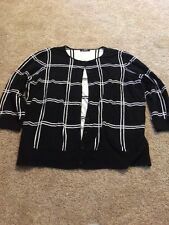 NEW Ralph Lauren Womens Size L Chaps off Zip Up Soft Hounds tooth Check Sweater. Condition is New with tags.Super soft all cotton, heavy, unworn, size L. Shipped with USPS Priority Mail Medium Flat Rate Box. LACE UP PLACKET. MACHINE WASH COLD. COLOR: BLACK/ RED CHECK. LENGTH: 31". RED & BLACK IN COLOR. HEAVY SWEATER. MATERIAL CONTENT IS 100% COTTON. Machine washable. Chest: 44", Length: 24". It's wrinkle free, no iron required. Type: Crew Neck Jumper Sweater. Colour: Blue White. Pattern: Check.